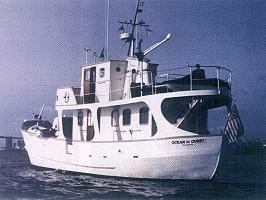 Welcome to the information site on the Motor Vessel "Ocean Quest". Our Website has a host of information on the vessel, so please feel free to explore its history. In recent years, the Ocean Quest has been used as a movie set by the government; the US Coast Guard used it for some weeks during the production of a Discovery Channel/TAMS Production movie to be called "High Seas Cops" about drug seizures. In addition, the Ocean Quest has been used for assorted charters, by the day or weekly, as well as for a host of gala parties during the '96 Republican Convention in San Diego, California. The vessel is open to any form of charter or usage that falls within its documentation set forth by the US Coast Guard. Rehabilitated? You're thinking we turned to the wrong page in the Thesaurus, right? Surely we mean one of [hose other "R" words like refitted or restored, refud)ished, rebuilt, even rejuvenated or reborn. Nope. Ocean Quest has been rehabilitated. It's at this point that things started to turn south The Tiki's new owner fell victim to the recession in the early 1980's. He could no longer afford her upkeep and attempted to sell hen When no prospective buyers materialized, he became desperate and enlisted the Tiki's help in a plan to solve his financial woes - smuggling. It was a bad plan. The Tiki was seized by the DEA and U.S. Customs Agents in San Francisco while attempting to smuggle 30 tons of marijuana into the country. She was held in seizure for several years, then put up for inter-agency use. Finally, she was offered to the general public. instead of a new civilian owner, the Tiki was enlisted once again, this time by the U.S. Navy. They stripped off her name, painted tier gray and designated her "CT1 8." She became a training platform for minesweeping techniques and was used by the Navy for three years. 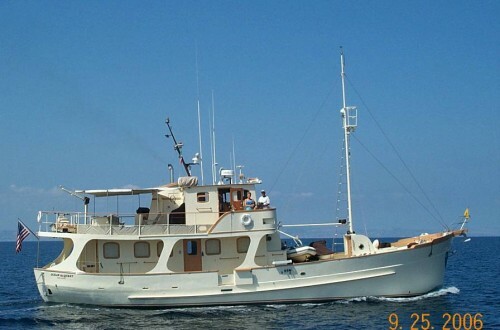 Then they decommissioned her and put her up for public auction. She was used, abused, in a sad state of disrepair, and had a checkered past She needed lots of attention and TLC to turn her around. She needed Bill Lee. 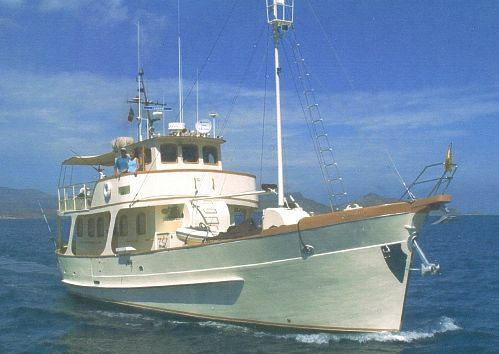 Purchased under sealed bid in 1990, Bill christened the cx-"TikiICTl8," Ocean Quest and began her "rehabilitation." He stated with repair of the hull and deficiencies created by the Navy, rebuilding of the engines and propulsion, system and modernizing [the engine spaces. A separate auxiliary engineering space was created to hold the generators, an 8kw Onan, a 3kw Yanmar, a 2-1/2kw Trace inverter with a bank of 9 Lifeline AGM batteries, and a 50 gph custom built water maker system and a backup 10 gph unit.